I wasn’t really sure what to expect when signing up for a night high in the mountains near Osaka in a traditional Buddhist Temple. Kris and Becky had both expressed an interest in doing this, and I’m never one to turn down a new experience, so here we are. At the door we are greeted by a monk. I wish I could say he was all dressed in traditional orange monk robes, giving off an ethereal peace and reminding me what dedication truly is. In all actuality, he seemed like a completely normal, everyday dude. His non-conforming plain grey t-shirt and brown sandals simply state that this man enjoys being comfortable in his time off. He greets us kindly and shows us in. His English is remarkably good, and he does his best to welcome us by showing us to our rooms and serving us cold (and much appreciated) tea. After giving us an over-view of when and where we are expected to be, he leaves us to gawk at our room(s). 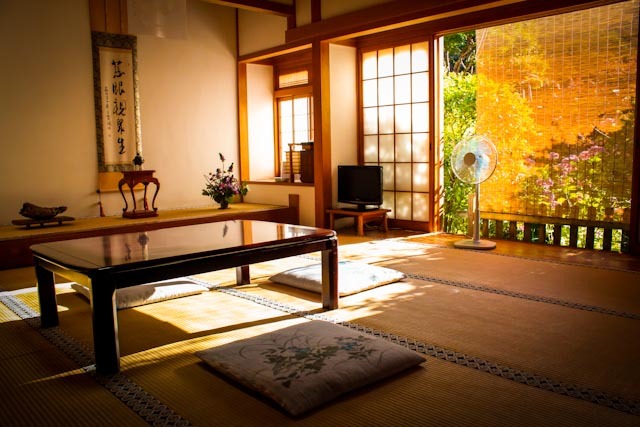 When signing up for a night on Koyasan, you are expected to choose a “price-range” which ranges from basic rooms to really fancy things like rooms with garden views. Being meager English teachers, we opted for the bottom bracket. Then, the mythical, unseen coordinators of Koyasan work their magic and find you a room in a temple of their choosing somewhere on the mountain that matches your choices. It’s all very vague, and not exactly cheap ($80 minimum per person/night). That said, it’s kind of thrilling when you get your “assigned” temple and obviously a very rare experience. As we walk around our room, we feel incredibly lucky, and can’t resist making some-what childish squeals of delight as we enjoy our new quarters. There are 5 of us in total, Becky the Banana, Kris, Carolyn, and friend from Florida, Julie. We ended up with two connected rooms with a view of the most peaceful garden I have ever seen. The afternoon sun streams in the windows, warming the room with a golden glow. We can even hear the koi swimming merrily in the pond just below the deck of our rooms. Wow. We were told that we are allowed to use the onsen (hot springs) to bathe if we’d like, before going to dinner at the at 6pm. Us four girls are giddy with excitement and rush to relax in the onsen. After getting impossibly clean in the hot, pure onsen waters, we don our provided yukatas and head over to dinner. It’s served in a traditional Japanese style room, complete with rice paper sliding doors and tatami mats. Our dinner is the same one that the monks eat, very pure and 100% meat free. That said, there are many items we end up discussing as we don’t really know what they are. It’s less a dinner and more of a feast, actually. It takes us a full 2 hours to eat our dinner (it’s expected to be eaten slowly) and by the end we are completely stuffed. Careful to return our dishes to their original place on our trays (another custom), we then saunter off to our rooms. By now, night has fallen and the lanterns in the garden are on. While at dinner, our room was transformed. Where the table and mats once were, now sit five of the most comfortable-looking futons I’ve ever seen. Kris and I quickly grab our cameras to shoot pictures before our earlier adventures around Osaka get the best of us. After about an hour we all decide it’s time to call it a day, as we need to be in top shape for prayer at 7am the next day. Early the next morning I end up waking up far to early and decide to stroll around the grounds. The complex is almost u-shaped, with the garden in the center. Across from our rooms are the monk’s quarters, the bottom of the U is where the dinning, entry, and bathing areas are, and our rooms make up the other side. There is a resident cat who greets me as I slip on my shoes to look at the entry garden and the temple near the massive gates. I can’t help but feel as quiet inside as this complex is now, so early in the morning with the rising sun barely illuminating anything. I think I could stay here for quite some time. At exactly 7am, the prayer session starts. Turns out, our monk friend is actually the head monk! He’s wearing his intricate purple robes as he begins the ceremony with long, meditative chants. Unfortunately, I’m not well-versed enough on Buddhism to have any idea what was going on. I do know, however, that if you’ve never had the chance to experience a ceremony like this, you absolutely must. It’s so incredible and different from any of our Western religions. His chants roll through the air as we sit and listen quietly, admiring the inner temple and the powerful atmosphere. At one point, we go up in turn to sprinkle what I think is incense into a vase and offer our prayers. The ceremony lasts an hour, but I barely even notice. Afterwards, we sit down for another meal (breakfast) that is very similar to our last. It’s consists of some the most fascinating items. All kinds of veggies, all prepared in all kinds of ways, obviously with care and consideration. There is even a cute baggie made of tofu containing more veggie morsels. Again, we take our time with the meal and enjoy the open doors looking over the garden. Then, sadly, our time at Koyasan has come to an end. We gather our things, say goodbye to our lovely rooms, and walk soberly to the front. I think everyone enjoyed their stay too much. Becky, on a spiritual high, uses a rather intricate Japanese sentence to express her gratitude, at which our monk friend smiles politely to. I’m not sure if he understood her, but the sentiment was there. In all his elegance and obvious spiritual devotion, he reminds us that we still need to pay (turns out he’s also the accountant too!). Haha, back to reality, it seems. Loved this post, sounds like an absolutely AMAZING experience!! Thanks Nicky! It was so amazing!